It's in the trees. It's coming. Yesterday saw the 30th anniversary of the release of Kate Bush's seminal album the Hounds of Love in the UK. It's in my top 10 list of favourite albums of all time and a Prog Rock classic. 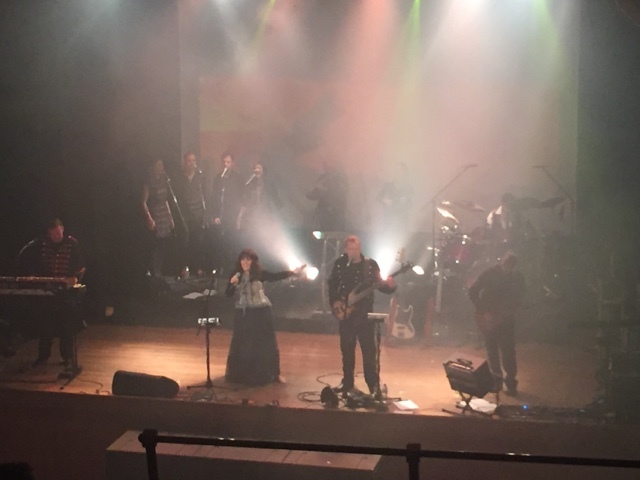 Commemorating this 30th anniversary premier Kate Bush tribute band Cloudbusting performed the album in its entirety (plus a few extra Kate hits and favourites) at the Islington Assembly Hall last night in glitzy Upper Street. Cloudbusting are uber-fans and perform note for note recreations that would make Ms Bush proud. In fact having seen the old girl herself four times last year I might even say that the vocals on display by Cloudbusting's lead singer Mandy Watson last night were at least on a par. At least. If you closed your eyes it was her. Actually you didn't even need to really close them at all as Mandy Watson's Kate is a bit of a lookie-likie too. In the crowd were musicians who had worked with Kate and played on some of her recordings and worked on her Tour of Life tour. Brian Bath was there - a seminal figure in Kate’s career. He was the guitarist with the KT Bush Band from their formation in April 1977. Preston Heyman was there too - he created much of the original drumming on Sat in Your Lap. Lucky for us Preston came up on stage and played on a couple of songs. Preston had first found fame as part of Gonzales with their hit I Haven’t Stopped Dancing Yet before becoming part of the EMI house band. Providing backing vocals was the four piece London Bulgarian Choir and they were wonderfully harmonious, weird, grunty and screechy as required. Unlike Kate Bush's Before the Dawn show last year we got all the hits and more! Sadly no rocking house on stage, trees falling from above or flying helicopter in the auditorium but a top, top night all the same. If you get a chance to catch them. Do. They were great.